Vacations are often viewed as a time to unplug from our busy digital lives and reconnect with friends and family in a more intimate setting – you know, in person. Those interested in booking room 2425 at the Hilton Panama, however, likely have little interest in the latter. The Alienware room is a gamer’s paradise. As Homecrux highlights, the pad is equipped with a high-end Alienware PC running an Intel Core i7 8700 CPU, an Nvidia GeForce GTX 1080Ti GPU, 32GB of DDR4 RAM and Windows 10 Pro. There’s also a laptop on hand – an Alienware 15 – sporting a Core i7-7700HQ chip, 32GB of memory and a GTX 1070 which should be handy if you can’t leave the desktop for more than five minutes to use the restroom. There’s also an Oculus Rift virtual reality headset on hand as well as a 65-inch 4K OLED TV paired to a 5.1-channel audio system and a 34-inch Alienware monitor for desktop gaming. And that just scratches the surface as you’ve got Alienware-everything accessories (keyboards, mice, palm rests) plus Xbox One Elite controllers, a gaming simulator chair and even full-room lighting effects. Should you somehow decide to pull yourself away from the gaming action, you’ll find two king beds and a luxurious bathroom at your disposal. 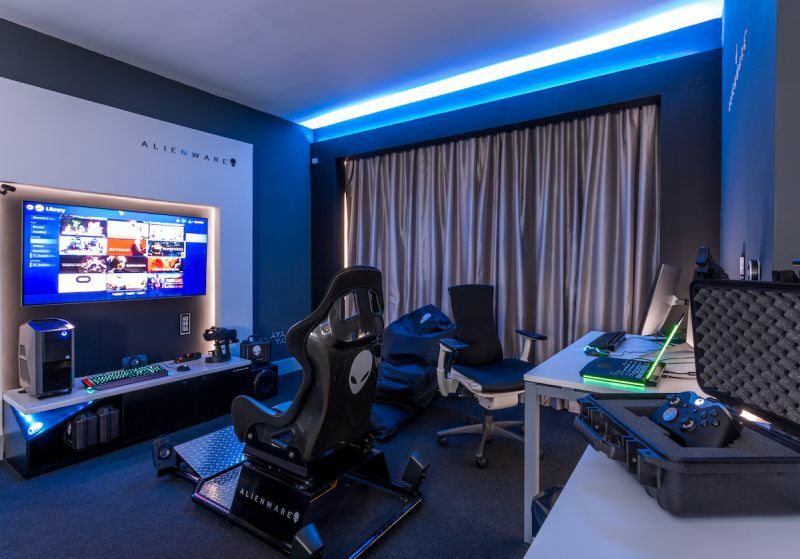 The Alienware gaming room at the Hilton Panama is now available at a somewhat reasonable $349 per night.